The successful capture last week of Mosul, Iraq’s second largest city, by the extremist organization Islamic State in Iraq and Syria (ISIS) – and the group’s continued push toward the Iraqi capital, Baghdad – seemed to confirm widespread fears in the Middle East that violence in Syria would spill over into neighboring states. This year, our newest poll reveals that people in these same neighboring countries are also concerned that extremists, such as ISIS, will prevail in Syria. Worries about spillover violence have been most pronounced in Lebanon, which borders Syria and has taken in a majority of Syrian refugees, many of them children. In Lebanon last year, nine-in-ten said they feared that the conflict between the Assad government and rebels would spill over into other countries. Even more Lebanese (95%) worried that their own country would be affected, with at least six-in-ten among the nation’s Christian, Sunni and Shia communities very concerned about this risk. Compared with the other countries we surveyed last spring, those in Turkey were somewhat less concerned about the regional impact of Syria’s civil war, although a 55%-majority still worried that the violence would spread. Even more Turks (62%) fretted that the conflict would cross into their own country. The ISIS’s capture of 80 Turkish nationals during last week’s seizure of Mosul underscored just how much a threat spreading Syrian violence could be for Turkey and its citizens, even if far from Turkey’s borders. Although the rebel forces aligned against Assad span a wide spectrum, people in neighboring countries are clearly worried about the threat posed by al Qaeda or other extremist organizations, like ISIS. Asked in April-May of this year whether such groups could take control of Syria, majorities or pluralities across the seven Middle Eastern countries surveyed answered yes. Concern is highest in Lebanon, with 86% worried that Syria may fall to extremists. Clear majorities of Lebanese Christians, Shias and Sunnis agree that al Qaeda or similar extremists pose a threat to the Assad regime. 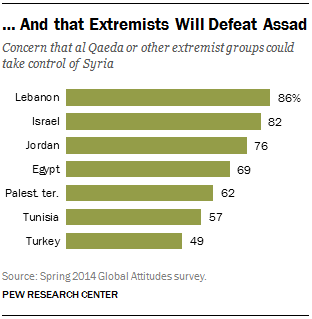 Outside Lebanon, concern that extremists will take control of Syria is greatest in Israel (82%) and Jordan (76%). The Turkish public again is somewhat less worried than its neighbors about events in Syria: only about half (49%) worry that extremists will emerge victorious from the battle with Bashar al-Assad’s government. In recent days, of course, global attention has focused on the ISIS’s battlefield success in Iraq, with the U.S. and other governments weighing political and military options. When the conflict was confined to Syria, many nations, including the U.S., had been reluctant to become involved militarily. People in the Middle East may wonder at any distinction between unrest in Syria and Iraq, as many had long anticipated that Syria’s violence would spread to neighboring states.